ANNAPOLIS, Md. — “Hold on to your hats,” Mike Babcock said as he exited the interview room at Navy-Marine Corps Memorial Stadium. The Maple Leafs’ head coach was referencing the wind, as his team prepares for what may be the windiest NHL outdoor game ever played on Saturday night at the United States Naval Academy. 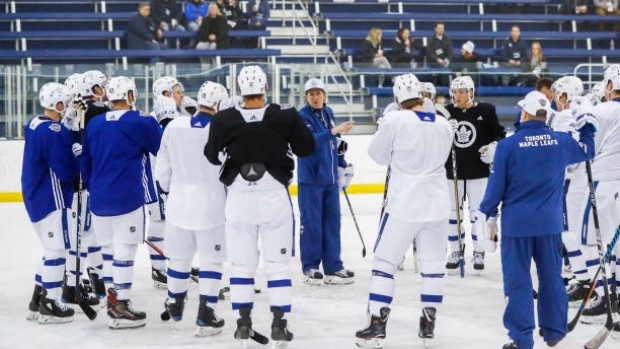 The gusts hit 76 km/h on Friday, forcing the Leafs indoors for practice. But Babcock also could have been referencing Toronto’s six-week stretch run that began as the calendar flipped to March. It’s time to buckle up. Babcock called the 2018 Stadium Series an “opportunity.” There are two points on the line, of course, but it is also an opportunity to take inventory on the Maple Leafs. Because in order to get where you are going, you must know where you’ve been. Facing the Washington Capitals, who knocked the young Leafs out of the playoffs last spring, makes this weekend a fitting reflection point. Babcock called the Maple Leafs’ growth over the last 11 months “significant.” They are the ones ahead of Washington in the standings this time around. Capitals star Alex Ovechkin, who is three goals short of 600, said Friday that “everybody knows how good Toronto is, how talented they are.” The Maple Leafs weren’t going to sneak up on anyone this year – and they’ve handled that test well. “The first thing that happens when you're not a very good team, no one takes you very seriously,” Babcock said. “Then you play this year and you're a good team and every night you're getting a real game. You know how much harder it is to get points. “I just think we're significantly better because our young guys are better. They’re harder. They've been through it more. They’ve seen what it’s like. They’ve been eliminated from the playoffs. They know right away here you get in the playoffs and then 10 days later one of you is moving on and one of you goes home." Knowing that, the question facing the Maple Leafs is: How can they use the Stadium Series as a springboard to peak at the right time heading into the Stanley Cup playoffs? Morgan Rielly is among the believers that entering the playoffs on a hot streak, as opposed to backing into them, can be the difference between golfing in early May and skating into June. It feels like forever ago that Andersen called out his teammates after blowing a third-period lead in Philadelphia, but that was just six weeks back. Andersen told his fragile team through the media that they needed to “look each other in the eyes and determine where we want to go from here.” They were treading water, comfortable in playoff position, but going nowhere during a 5-7-4 run. The Leafs have the best record in the NHL (14-3-2) and the most points (30) since that night. Andersen viewed it as another tick on Toronto’s growth chart. There are those who wonder whether Toronto has peaked too soon, playing is best hockey ahead of when it really matters. Andersen believes they have another gear left to find. Development is not a straight line in the NHL, not in a league with such parity and younger players carrying the load more than ever before. The next step will be the biggest.